I hate abortion. Not as a medical procedure, as an issue. I hate that it has become such a powerful tool in the political bag of tricks that millions can be led by the mere mention. Abortion is like that ring in the bull's nose. The bull is a massive, dangerous, deadly animal - just like us voters - but you jam a piece of metal in the most sensitive part of his face, and you can lead him around with one finger. You think politicians really care if women have access to safe means of terminating a pregnancy, or for preserving the life of every tiny fetus? Then I have a bridge to nowhere to sell you. Abortion is the shiny object, the "Look Over Here" that the magician does while he is hiding the Ace of Spades. While millions of pro-life and pro-choice (really, does anyone believe those terms?) voters toil and organize for their cause, the dirty work of politics goes on unimpeded. I wish there were some way to take it off the table, once and for all, but I don't think there is. The politians don't want it to be gone. I am sure we will be fighting this same lame battle my whole life as war profiteers laugh and the middle class shrinks and millions go without health care. Abortion hurts all of us. I never talk about work here but today I will make an exception. I had lunch with a friend yesterday and said "I'm so happy at work lately that I don't know if it could get any better. And if it does, wow, I am excited to see what that looks like." We came back from lunch and our big bunch of bananas was GONE! Obviously someone from one on the fruit-free divisions who surround us was jealous of our fine fruit! Scandalous! Rachel and I went hunting for our bananas like chimps on a rampage. We decided that if someone were stupid enough to steal our bananas, they might be stupid enough to store them in one of the three refrigerators in our kitchen area. We opened the first fridge and got knocked back a few feet. It was like the gates of hell had opened and we got a whiff of one of Satan's farts. What IS that? It is a funk that only an office fridge can produce, a fridge shared by 200 people, none of whom want to take responsibility for That Thing rotting in the corner. Rachel and I hightailed it back to our cubicles, bananaless but thankful that we had all pitched in about 6 months ago and bought our own little, funk-free fridge. Every once in a while, I post something on Linkateria that I think deserves a wider audience. This is Glozell. She is amazing. CC and I watched this and laughed til we cried last night. I dated this guy a while back and he broke up with me for what I thought was a stupid reason that I don't want to go into here because that is a Whole Nother Ball of Wax. Him: I'm concerned because I think you (insert stupid reason here). So I think we shouldn't see each other anymore. Well, hell, come ON, I'm in my 40s, not 17, so I really don't need a long-drawn out emotional call rehashing the reasons we shouldn't see each other anymore. I sat there on the front steps with my coffee and my cell phone in my hand and I thought "Oh, yeah, right, he's stupid. So that's that." I did have one follow-up conversation with him since we sometimes work together for the same organization and I wanted it to be cool if we got stuck in the same room, so we made mature adult noises and settled that. CC and I went out and ran into him. He immediately came over and started talking to us, all about him. And on and on, him him him. He finally told me I looked great and then screwed that up by quickly adding "And you look great, too" to CC and then getting all awkward because it sounded totally insincere and tacked on. CC asked me in an aside if I wanted to go out to coffee with him. Sure, no problem, I thought, let's get a group together and go, since we were at a place that was closing anyway. He said yes and CC went to round up more people, leaving the two of us standing on the sidewalk. He immediately put his arm around me and said "I think I made a huge mistake breaking up with you." "I know," I said, not in a come-hither way but in a "Well obvs, you dork" way. He tried to hug and kiss me and hold my hand. I couldn't flipping believe it, given our status or lack thereof. I was pretty much a shrinky dink, giving him all the "No way, Jose" body language. "Is this making you uncomfortable?" he asked and I said "Well, YEAH." By then CC and another girl were back so we ambled off to find a coffee place. He grabbed my hand and held on. He wasn't talking so I had to keep up all the conversation myself. It was pretty late and everywhere we went was closing, so I said "You know, I have to get up early so I'm going to turn in." As he hugged me desperately, I told him "I'll see you when I see you." Dang, I am cold. But come ON dude! Work with me here! If you have been a complete idiot, you at least have to do something to make up for being an idiot. Effort is required. You can't just see me and tell me I look good and expect to suddenly have me come running back (not that I would no matter what he did. Once an idjit, always an idjit). Not gonna happen. I'd rather go home and talk to my parakeet than spend time with a guy who can't figure out a semi-decent way to apologize. And I don't even have a freaking parakeet. 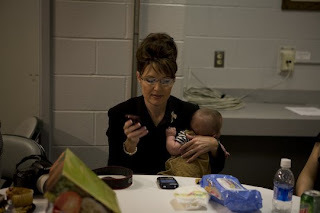 I saw this photo of Vice Presidential candidate Sarah Palin and her (or her daughter's?) five-month old baby this morning and my heart just squinched up. Some other people had posted it with "This is what feminism looks like!" excitedly, and I really had to stop and think why this photo made me feel so sad. I mean, moms should be able to work, right? And they shouldn't have to think of their children every single minute, I can see that. Women have always had to multitask. I wondered "Would I have felt the same way if it was a working mom in another situation, say, a mom with a baby in a rebozo, selling food at a market?" I don't think so. Seeing her texting made me feel sad. There is something to me unique about mobile devices - and I HAVE a Blackberry - because it takes so much attention and takes us so completely away from the present moment. The temptation to check the damned thing is always with us. I feel sad that mobile devices are running our lives. We don't have the patience or discipline to leave them alone. I have had so many frustrating, trying times with friends, feeling like I have to compete for their attention with their phone/device. Even if we are together, we aren't really together because they are always pulled elsewhere by little beeps and tones. Just the other day, in a lunch group of six, someone took a call right in the middle of the meal, at the table. It wasn't an important call, just one of those "Where are you, honey? Oh, I'm at lunch" calls. Totally unnecessary and it interrupted the whole conversation and messed with the group dynamic. It is normal to many people, but to me it is still quite rude. I don't think the sadness that came up when I saw this photo is about moms working while holding babies. It is more about how this technology has invaded our lives, and how easy it is to get carried away by it, and how much we miss out on when we do.